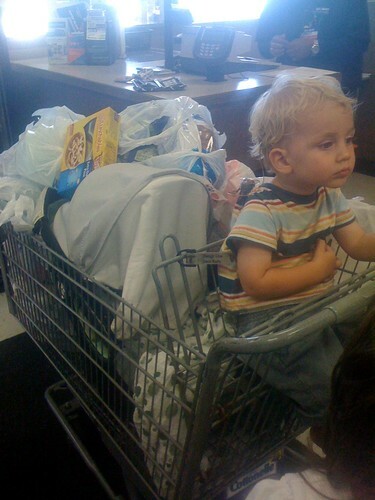 I always have to stop shopping when I begin to lose sight of the baby in the cart. That's my limit. There was one day when I was storing several items inside her carseat with her, on her lap, and I felt kind of guilty about that...I mean, what if I inadvertently made her lose circulation to her legs and she ended up as an amputee? I couldn't handle all the guilt. So now when we get to that point, we pack up and leave, and since I spend the entire grocery trip gabbing incessantly to the two kids who are on the loose trying to keep them from joining a new family who looks more fun than ours and bending over 7643 times to pick up the items Seth gleefully hurls at the ground, I distractedly throw foodstuffs I think we may possibly need into the cart basically at random. I never know what I managed to buy until we get home. Makes for some interesting dinners, let me tell you.